The uprooted Eezham Tamils from Champoor in Moothoor East of Trincomalee district complain that the occupying Sri Lanka Navy, which was supposed to vacate from Champoor Maha Viththiyaalayam School and the adjacent residential areas of 237 acres, has indefinitely postponed the hand over of lands back to the people. The promises made by SL President Maithiripala Sirisena have not been fulfilled, the uprooted Tamils said. The Eastern Provincial Governor Austin Fernando, who is a former defence secretary of occupying Colombo went on record on December 15 that the SL Navy would be handing back the lands before January 05. But, the SL Navy is now telling the people it would not move away for another 6 months, Champoor Tamils told TamilNet on Tuesday. 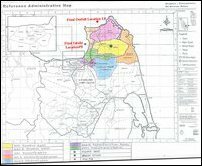 818 acres of lands that had been seized by the SL Board of Investment and transferred to Chinese-affiliated corporate of Rajapaksa regime, were handed back to the people of Champoor after Maithiripala Sirisena ousted the Rajapaksa regime with the backing of external powers that were opposed to Chinese. Mr Sirisena installed Austin Fernando, a pro-US Sinhala civil servant and former defense secretary during the UNP regime in the past as the colonial governor to Eastern Province. 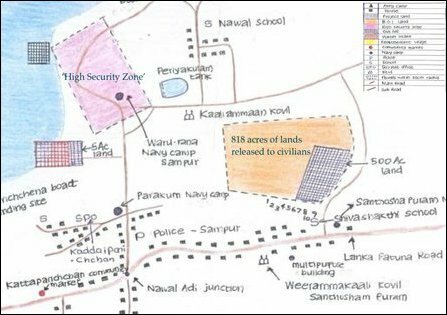 The SL regime was under heavy pressure from the uprooted Tamils to also release 237 acres of residential lands situated close to the 818 acres of BOI-occupied lands that were being released. The SL President had promised to release the 237 acres of lands and had instructed the SL Navy to relocate the so-called naval academy from the SLN-occupied lands. Before the SL military occupied Champoor, almost 1,000 Tamil students were attending the Champoor MV School, which functioned at the locality. A primary school, known as Srimurugan School, was also located at the residential area where 579 families were living. The Tamil families were self-sustaining with fishing along the coastal belt and agriculture in the fertile lands adjacent to the residential area. After seizing these lands from Eezham Tamils, the Rajapaksa regime was scheming a Sinhala township with foreign trade. The entire occupied Moothoor East was to be transformed into an ‘Economic Zone’. 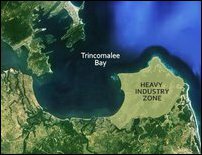 Foreign powers that have always been competing for strategic access to Trincomalee natural harbour were abetting the so-called development schemes of the SL State. The education of Champoor Tamils, once a thriving society, was completely ruined, says S. Jeyarajah, the secretary of Eastern Province Tamil Teachers Association. He was also blaming the TNA installed Education Minister in the Eastern Provincial Council for failing to address the educational needs of the uprooted Tamils. The SL military occupation of Tamil schools in Champoor continues for 10 years now, he said, urging the Tamil politicians and civil activists to demand immediate de-militarisation of educational institutions, which are still under SL military occupation. There are less than 450 Tamil students currently enlisted at Cheanaiyoor Cenral College situated near Champoor. There are around 200 Tamil students in the nearby Paddiththidal, Ki’liveddi and Ma’nat-cheanai villages, Mr Jeyarajah said. 09.11.15 Colombo intensifies demographic genocide in Moothoor, Trinco..
25.10.15 US designs target Trincomalee, Champoor Tamils remain depriv..
08.09.15 Disparity in US funding to schools in East creates dissensio..
16.07.15 SL Navy controls access to potable water in Champoor, Trinco..
26.06.15 Champoor Tamils should demand 1 bn compensation, political-d..
13.04.15 IC should act on de-militarisation of Valikaamam, Champoor: ..
12.01.16 Sirisena’s promises to Champoor Tamils not fulfill..
09.11.15 Colombo intensifies demographic genocide in Mootho..